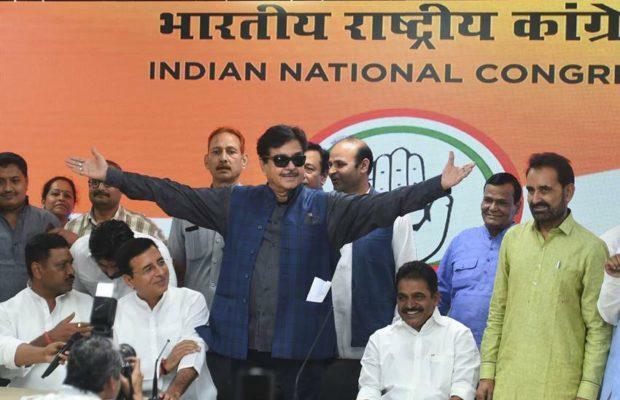 New Delhi, April 6, 2019: Actor-politician Shatrughan Sinha joined the Congress on the foundation day of the BJP on Saturday, saying he has quit the party as it has turned into a “one-man show and two-men army”. “In the BJP, democracy has slowly and surely turned into dictatorship. The party has become a one-man show and a two-man army,” Sinha alleged. Lauding the Congress’ proposed ‘NYAY’ scheme, he said such a proposal has never been unveiled in the country. Hours after he joined the Congress, the party on Saturday named Lok Sabha MP Shatrughan Sinha as its candidate from the Patna Sahib constituency against Union minister Ravi Shankar Prasad, who is the BJP nominee from this seat.